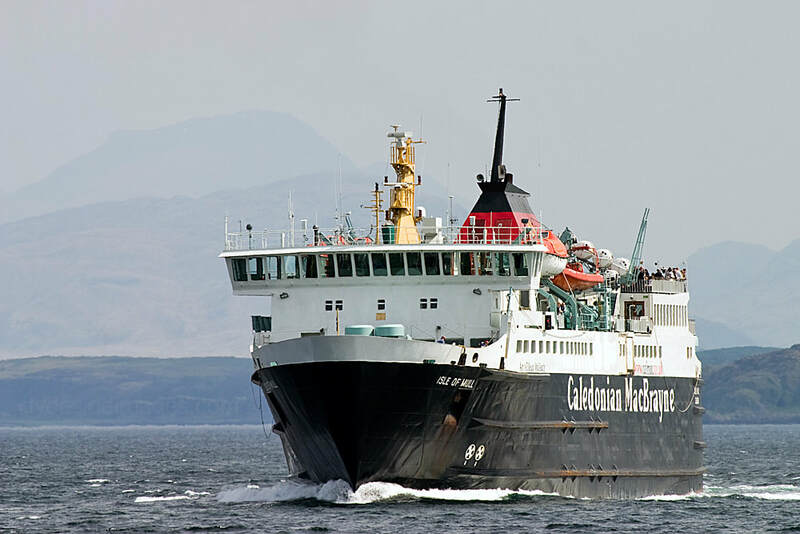 ​​Mull is the second largest of the Inner Hebrides and Caledonian MacBrayne operate three year-round ferry routes to the island, the most popular and main one if coming from the south being the sailing from Oban to Craignure. 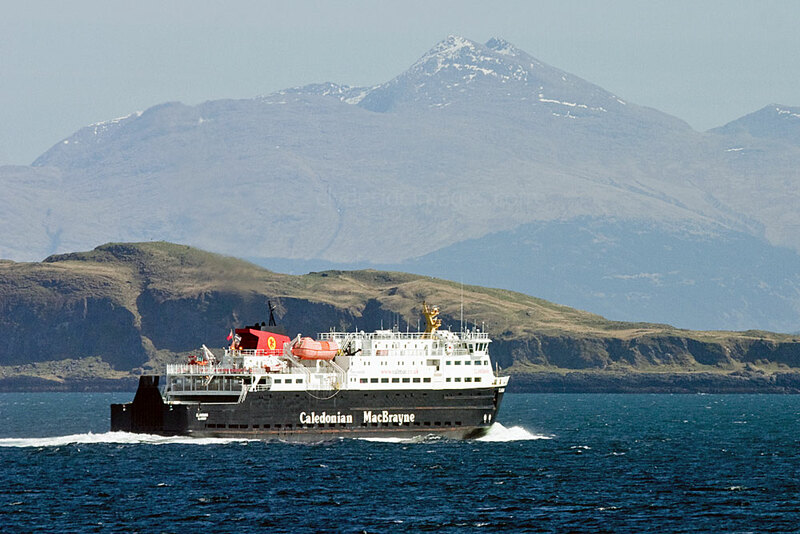 There are also services from Kilchoan on the Ardnamurchan peninsula to the island’s capital Tobermory, and Lochaline in Morven to Fishnish. 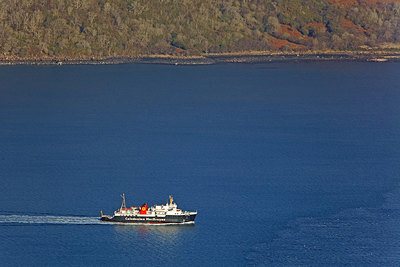 The last option, with a journey time of just 15 minutes, is most convenient for those travelling from the Fort William or Inverness areas and is also the cheapest. 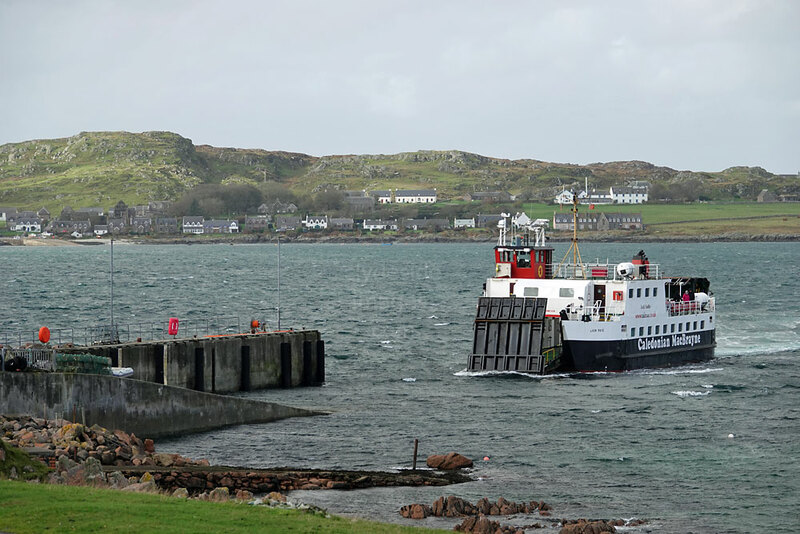 And, from Fionnphort at the tip of the Ross of Mull, it’s only a short hop to reach the world famous, historically rich island of Iona. 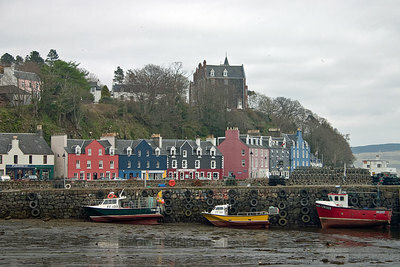 The island acts as a magnet for yachts and motor cruisers during spring and summer and several companies offer trips in small boats from Tobermory as well as locations on the west side of the island with Staffa, home to Fingal’s Cave, and the Treshnish Isles being the most popular destinations. A succession of small to medium-sized cruise ships call in and drop anchor in Tobermory Bay throughout the summer months to enable passengers to explore the town and other points of interest around the island. 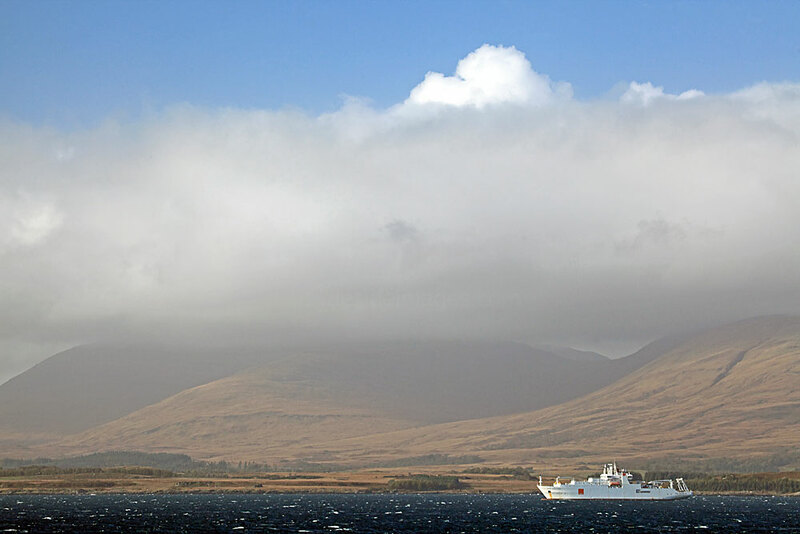 Vessels of all shapes and sizes pass by Mull, either via the open sea to the west or the sheltered passage known as the Sound of Mull which runs between the island’s east coast and Ardgour and Morven on the mainland. The Sound is often chosen as the optimum route by captain’s when storms prevail, especially in westerly gales as Mull’s high peaks act as a buffer to the worst of the weather. 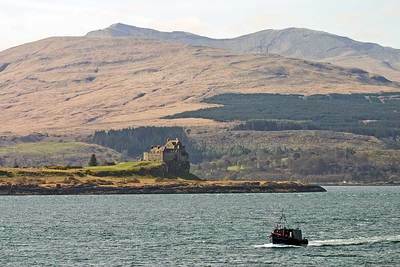 The 45-minute crossing from Oban to Craignure can be particularly scenic and there’s always the chance of spotting some wildlife on the way. 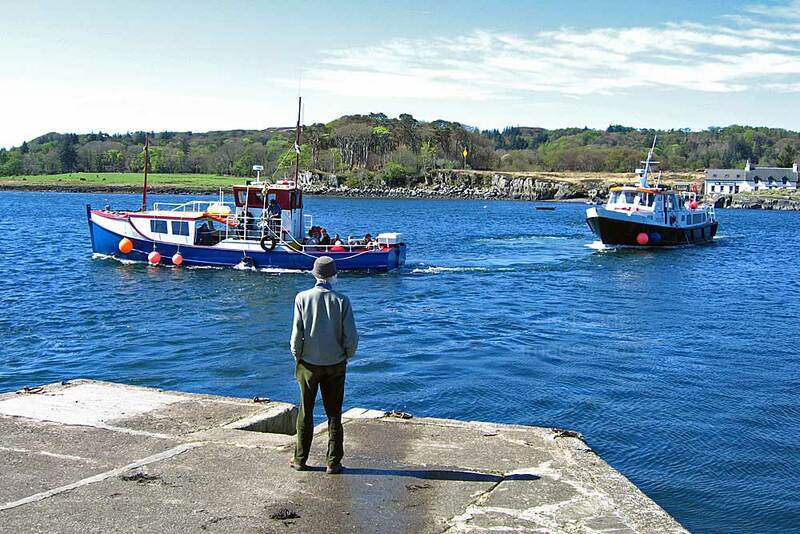 Craignure became the principal ferry port for the island in 1964 when a new pier, which had taken two years to build, was opened. The new boat, Columba, also took over the route from the older and smaller Lochearn. Ten years later, a roll-on-roll-off facility was installed alongside the pier. CalMac’s Caledonia and Glen Sannox operated the Oban route before the purpose-built Isle of Mull took over. 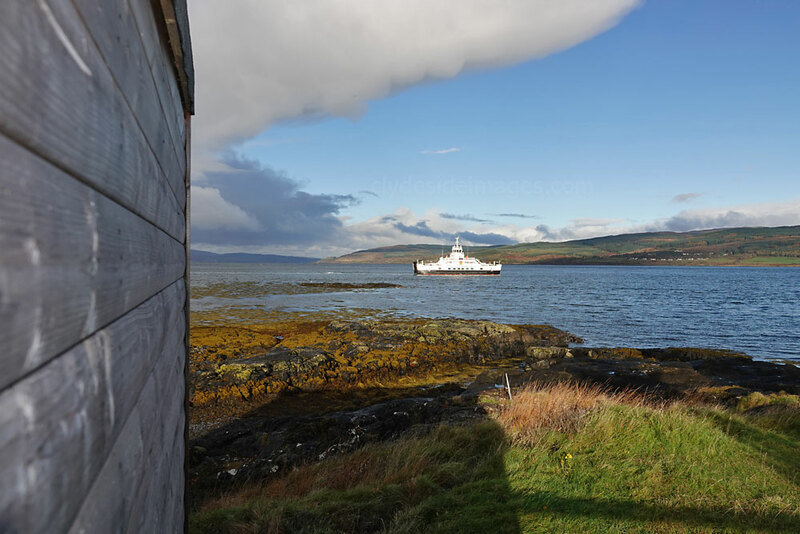 Prior to these innovations open boats were used at Craignure to separately transfer luggage and passengers between the pier and mail boat, a tricky enterprise in rough seas. 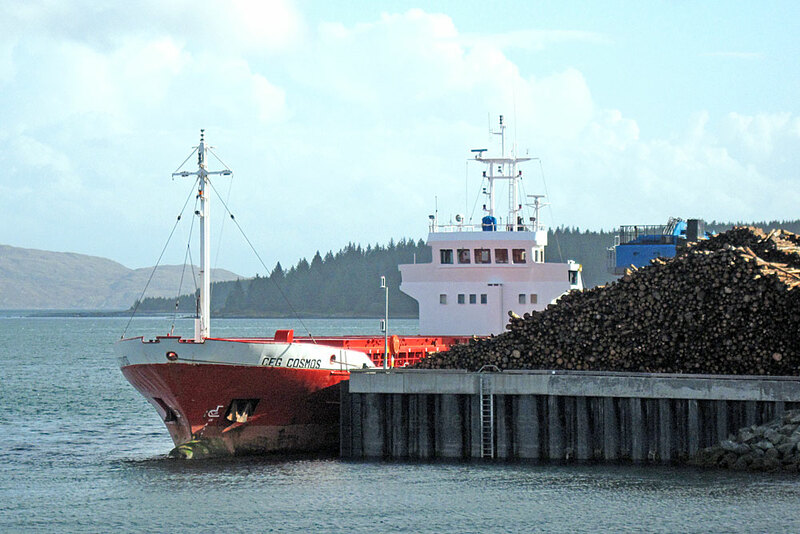 Red-hulled MV Ceg Cosmos was berthed at the Fishnish Timber Terminal for several days in October 2014. The 63 mete-long general cargo vessel flies the flag of Gibraltar but is owned by Fehn Ship Management of Germany where she was built in 1983. 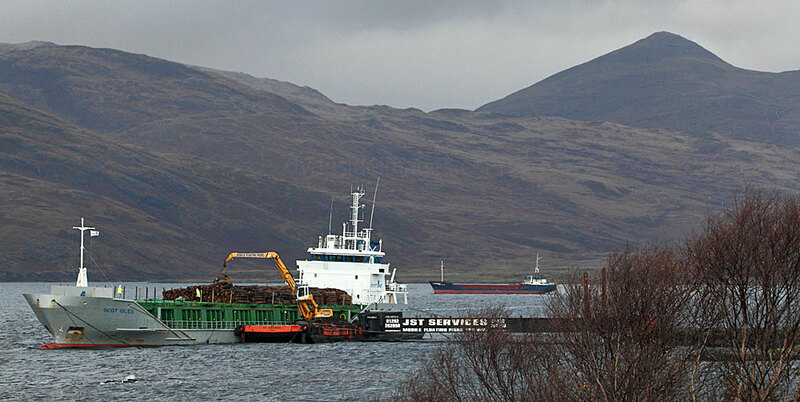 She finally sailed off just after dark on Tuesday 21st with a full hold of timber. Coincidentally, Ceg Cosmos was back loading at the pier again when I returned to the island in November 2017. 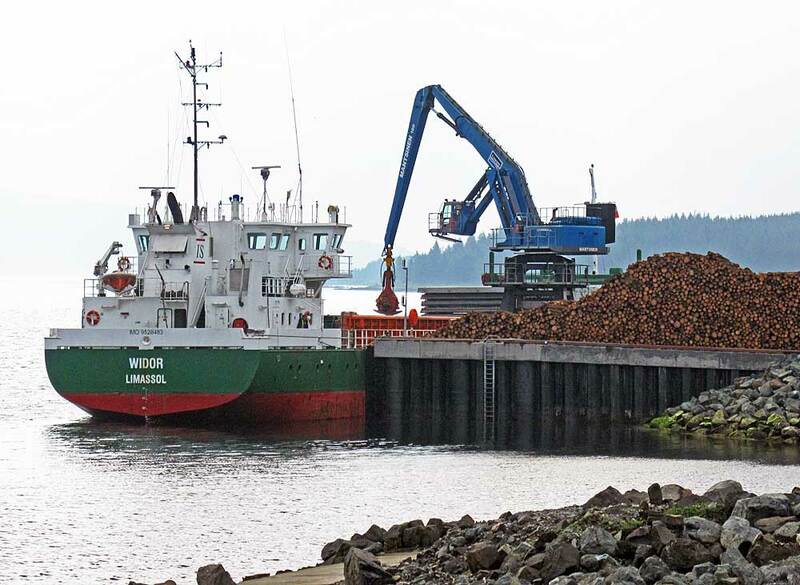 ​Along at Fishnish timber pier on Tuesday 20 May 2014, Widor was loading up. Fully laden by early evening, she left to deliver her cargo to Papenburg in Germany. This general cargo vessel is a product of Bodewes Shipyard, Hoogezand, in the Netherlands and was built in 2009. She sails under a Cypriot flag and is owned and managed by Interscan Schiffhart of Hamburg, Germany. 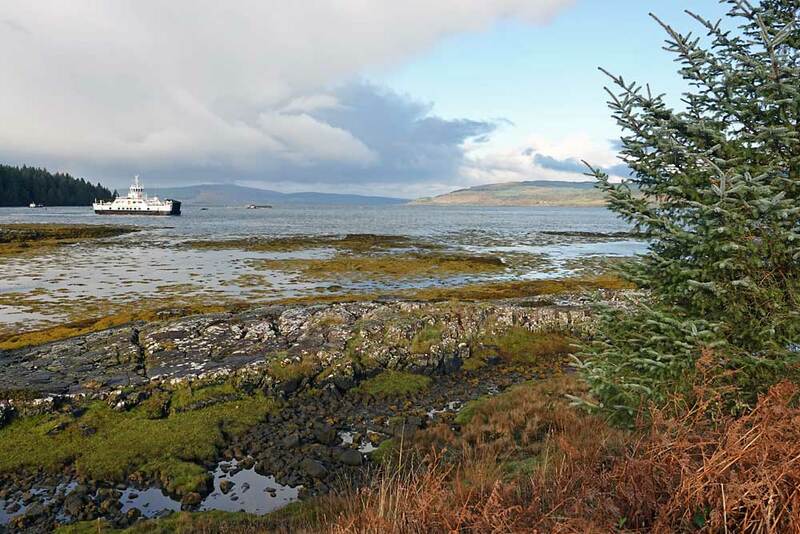 ​Another timber pier is located on the south shore of Loch Scridain near the island`s southwest tip. 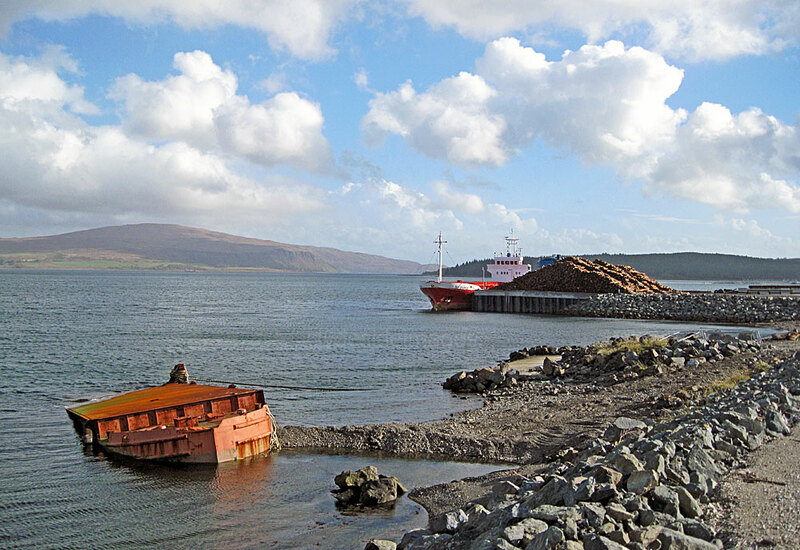 The facility at Pennyghael was created on the north side of the Ross of Mull in 2012 to enable the transportation of timber from local forests and the floating structure can accommodate cargo vessels with a capacity of up to 3,000 tonnes. 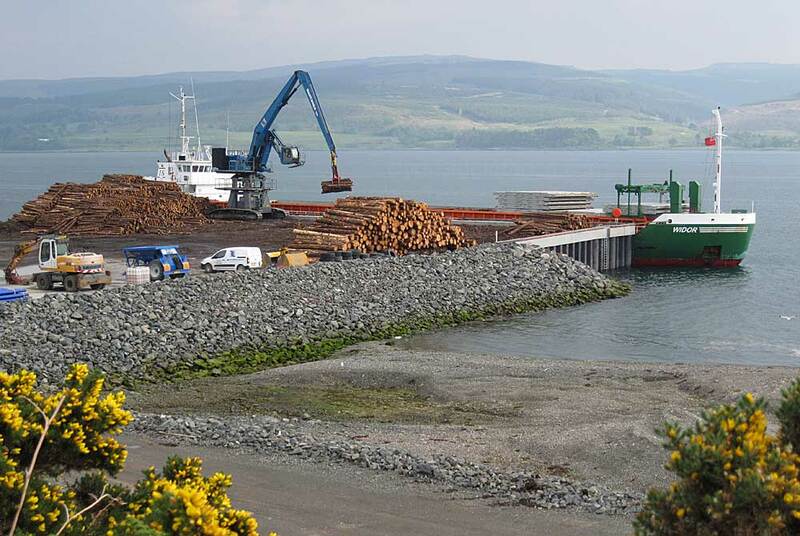 There is also a stone pier and timber stacking area which was funded through the Strategic Timber Transport Scheme (STTS), in consultation with, and the support of the local community. 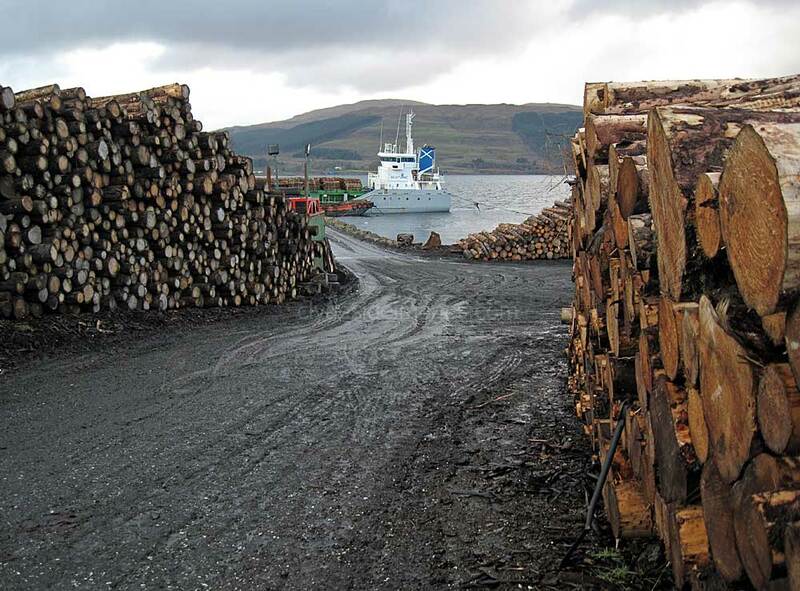 The scheme is an initiative of the Scottish Government and is managed and administered by the Forestry Commission in association with the Timber Transport Forum. 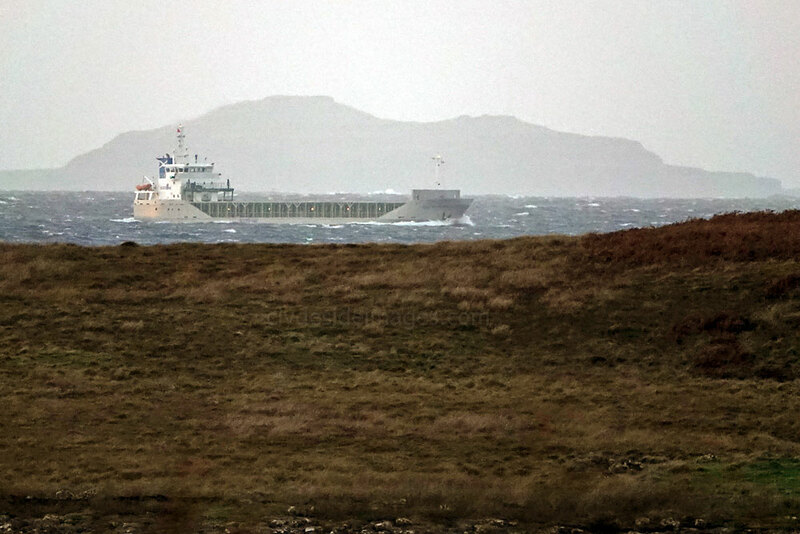 Dan Fighter (left) is an 852 Gross Ton (1260 DWT) general cargo ship which dates from 1988 and is a product of Ferus Smit Scheepswerf at Hoogezand in the Netherlands. She currently sails under a Danish flag and is owned and managed by Venus Shipping which has its HQ in Vestbjerg, Denmark. She has had several identities since launch, namely Feran until August 1991, Carolina until 1998 and Zuiderzee until November 2004. 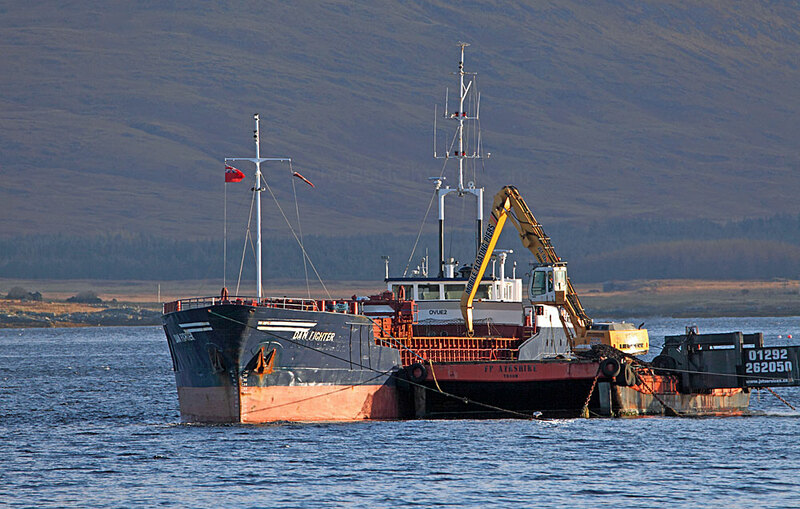 This single hold general cargo vessel is owned and operated by Fort William-based Ferguson Transport & Shipping and transports loads of up to 1,200 tonnes mainly around the West of Scotland, including the Western and Northern Isles, although she also calls in at various Irish ports. She was built in 1973 by RSW Rosslauer Schiffswerft in Rosslau, Germany. 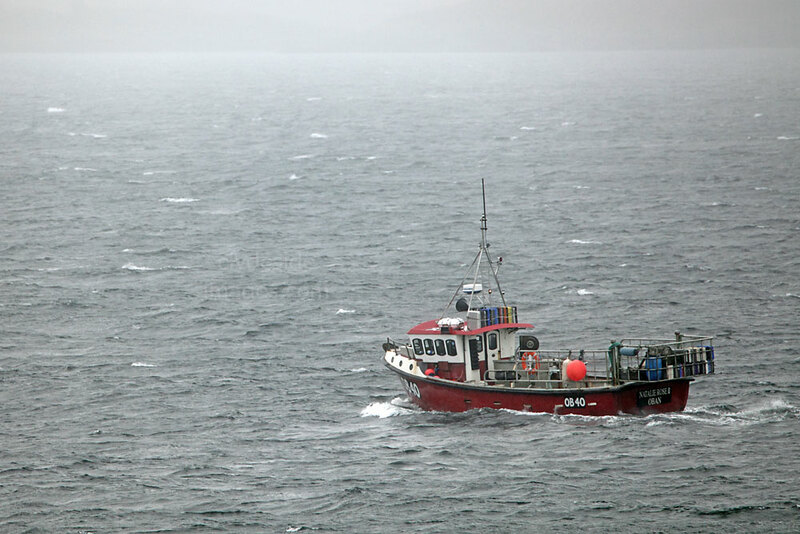 Built in 2007, Vlistdiep, is a product of the Bodewes Shipyard, Hoogezand, Netherlands, and is seen here heading up the Sound of Mull on a rather dreich day in November 2017. The largest vessels to regularly transit the Sound of Mull are the self-discharging bulk carriers Yeoman Bridge, Yeoman Bontrup and Yeoman Bank which operate out of the Glensanda 'super quarry' on the mainland. These ships are the largest, self discharging, aggregate carrying vessels in the world. This is Yeoman bank anchored in Loch Linnhe on 4 November 2017, waiting to head in and dock at Glensanda. 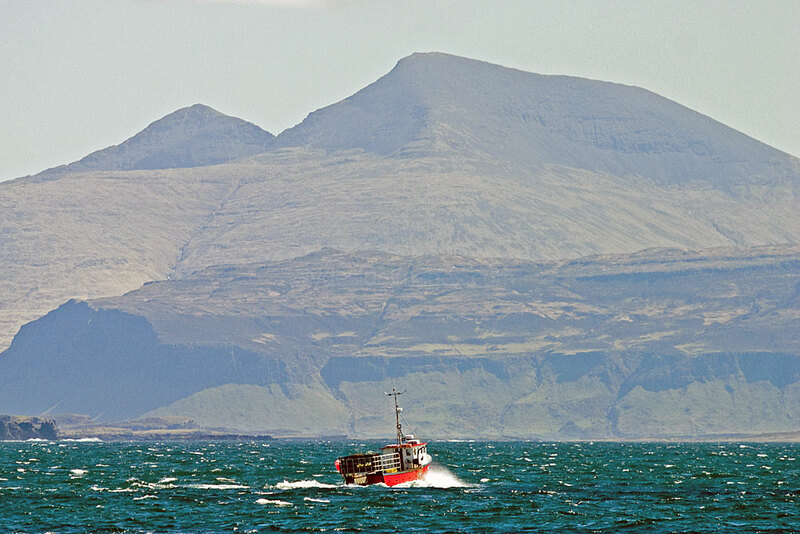 These shots were taken from the Mull ferry. 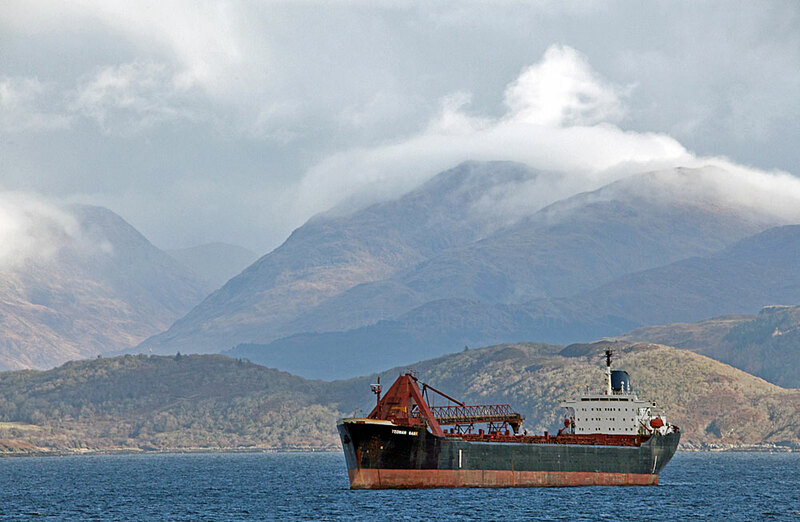 The remote quarry lies on the western shore of Loch Linnhe, and has been in production since 1982. The complex is operated by the Aggregate Industries group and lies within the 2,400 ha. Glensanda Estate. It's the largest granite quarry in Europe, supplying the whole of the northern part of the continent exclusively by sea. ​As it`s a pure coastal quarry all materials, vehicles and equipment arrive at, or leave the site by ship. 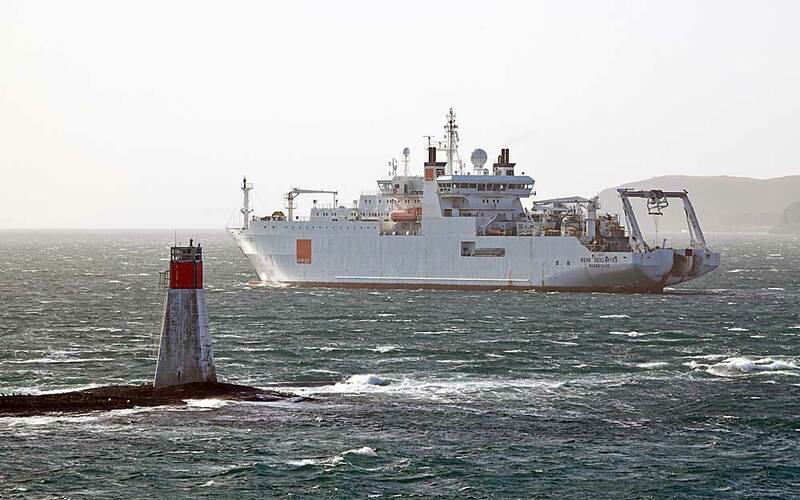 Each of the Yeoman vessels can carry the equivalent of 3,000 articulated lorries. 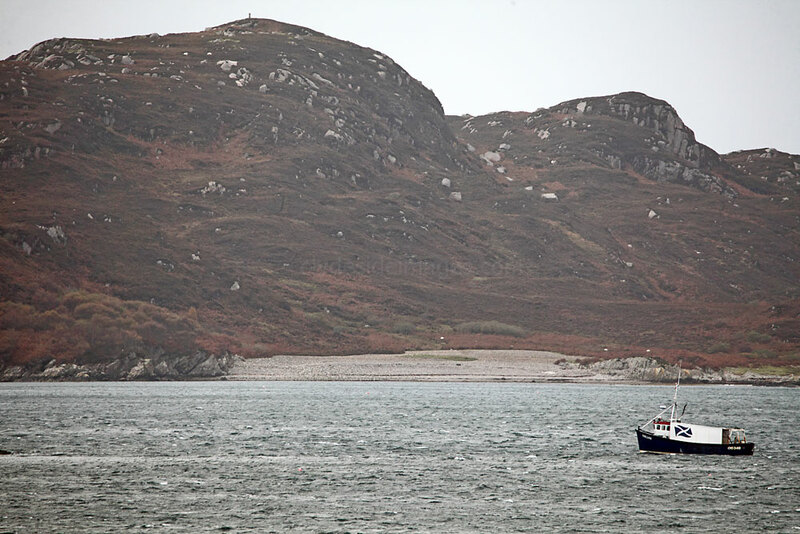 Granite is mined from Meall na h-Easaiche Quarry which lies high up on the coastal mountain from which it takes it name. In an effort to reduce the detrimental aesthetic impact in such a scenic area, the quarry has been dug downwards into the core of the mountain, around a mile inland. Controlled blasting usually dislodges around 70,000 tons of granite which is collected by massive dumper trucks and taken to the primary crusher. Thereafter, the smaller lumps are deposited on a conveyor belt which carries them and adds them to the permanent rock pile waiting to be processed at the top of a 1,000ft long vertical shaft known as the `Glory Hole`. Once they`ve fallen to the base of the shaft, the rocks are transferred to a second conveyor and carried for a mile, still deep underground, to the second crusher on the shore next to the deep water jetty. 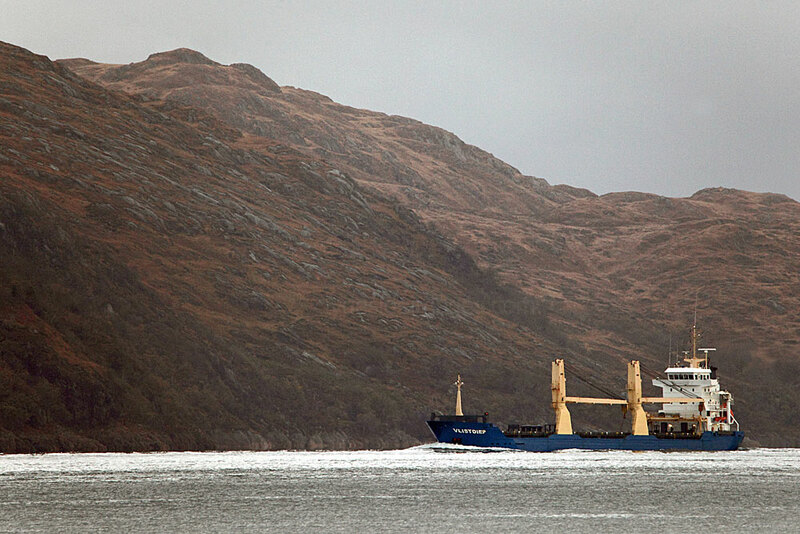 Yeoman Bank and her ocean-going sister ships transport up to 6,000,000 tons of granite aggregates from Glensanda all over the world annually. Despite the vast amount currently exported, it`s estimated that the quarry has reserves to last for up to 100 years. 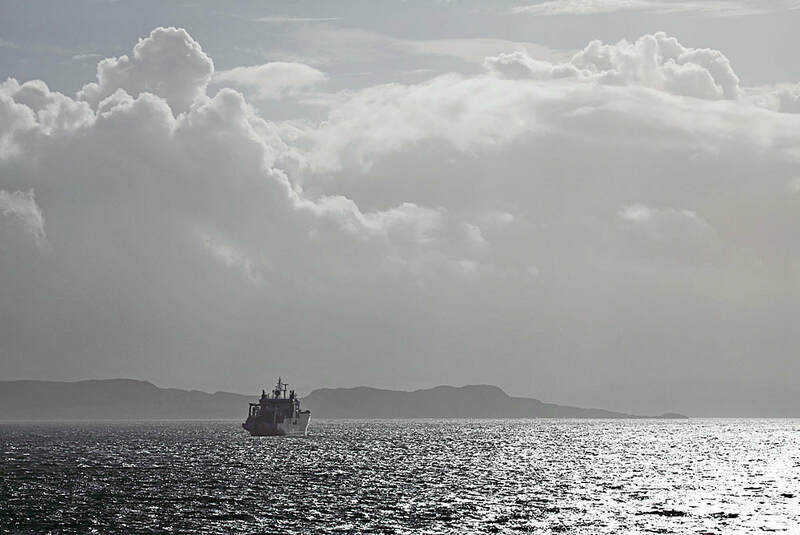 En route to Mull for a week-long stay in October 2014, the only vessel of note seen from the ferry on the way over from Oban was the French cable-layer Rene Descartes. 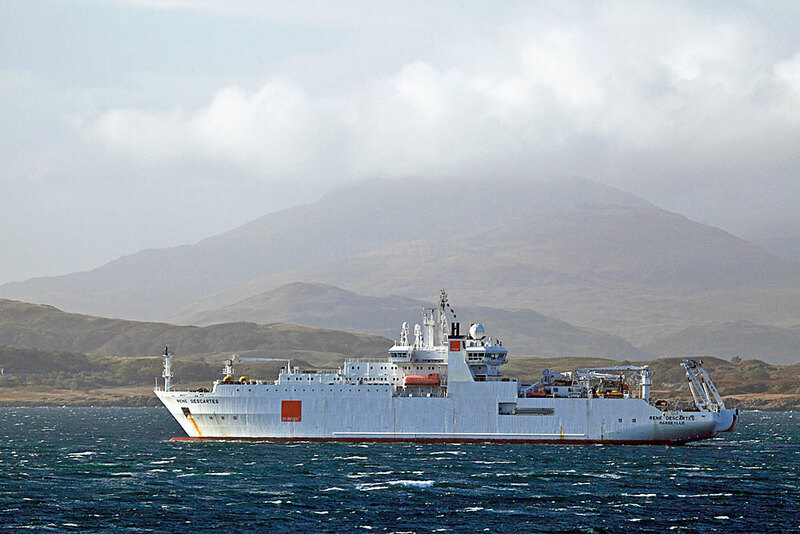 She had been at work in Scottish waters since May and was in the process of laying a new fibre-optic cable between Mull and the mainland. 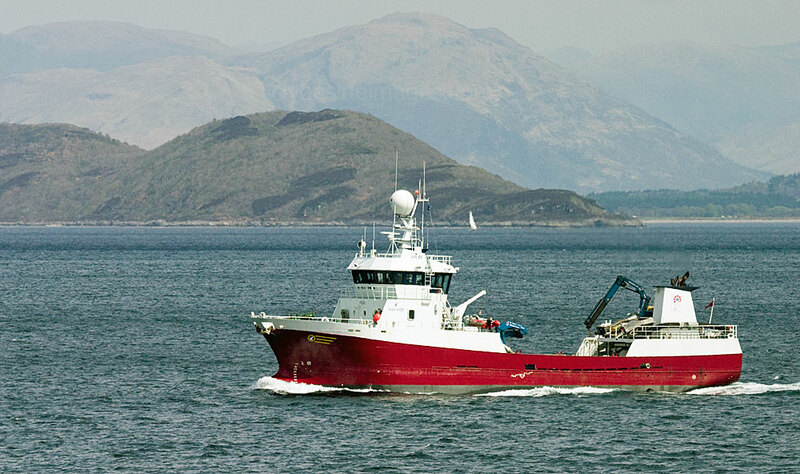 She had arrived on the Clyde in June and after working in the Firth, initially between Largs and the Cumbraes, headed north laying more stretches of cable at Loch Fyne, across the Corran Narrows, and between the Kintyre peninsula and Arran. ​Lismore Lighthouse which stands on Eilean Musdile in the Firth of Lorne at the entrance to Loch Linnhe. James Smith of Inverness was the contractor responsible for building the lighthouse which became operational in October 1833. Robert Selkirk, a descendant of Alexander Selkirk, the famous castaway who was thought to be Daniel Defoe's real-life inspiration for Robinson Crusoe, was the first Principal Light-keeper and he stayed in this now derelict cottage. 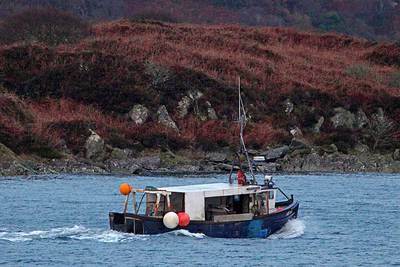 ​There is a scattered, fairly small but active fishing industry on Mull with most operators targeting shellfish and you can see their tiny boats out in most weathers. 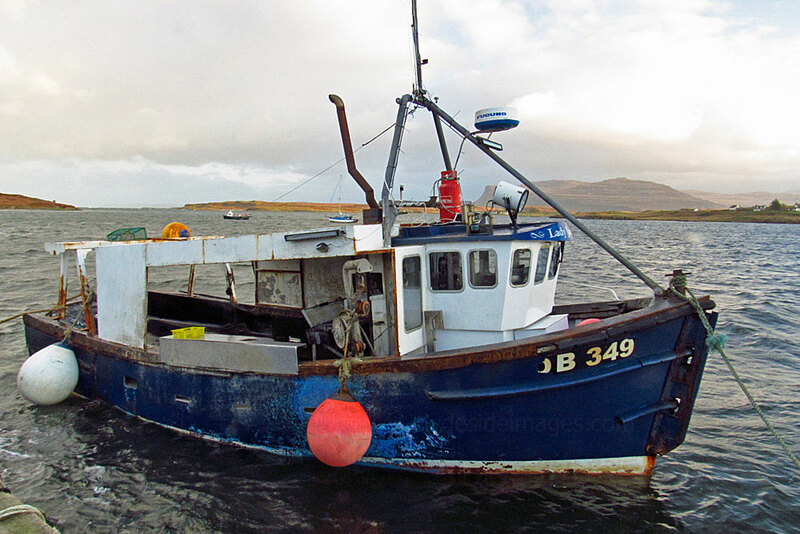 With an abundance of fish farms in the general area, Live Fish Carriers such as ​Ronja Skye (AAS 652S) (above) regularly transit the Sound of Mull and call in at the sea lochs on the opposite side of the island to collect fish or restock the cages. 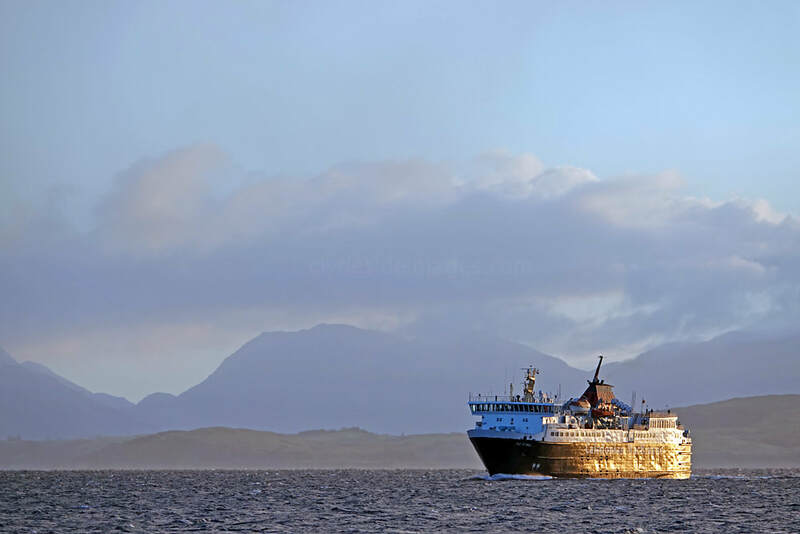 Ronja Skye has been operational since October 2001, and is equipped with an automated water temperature control and cleaning system, sorting, delousing and bulk feeding. In 2017, the island’s fish farm industry hit the headlines after thousands of salmon escaped in one of the largest ever breaches in industry history. 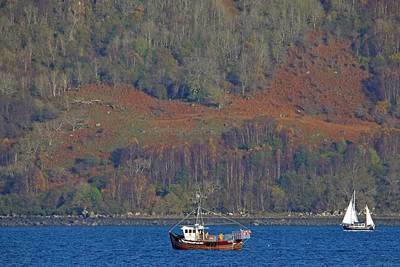 It’s believed the escape occurred when the site on the Isle of Mull was targeted by predators, most likely seals. 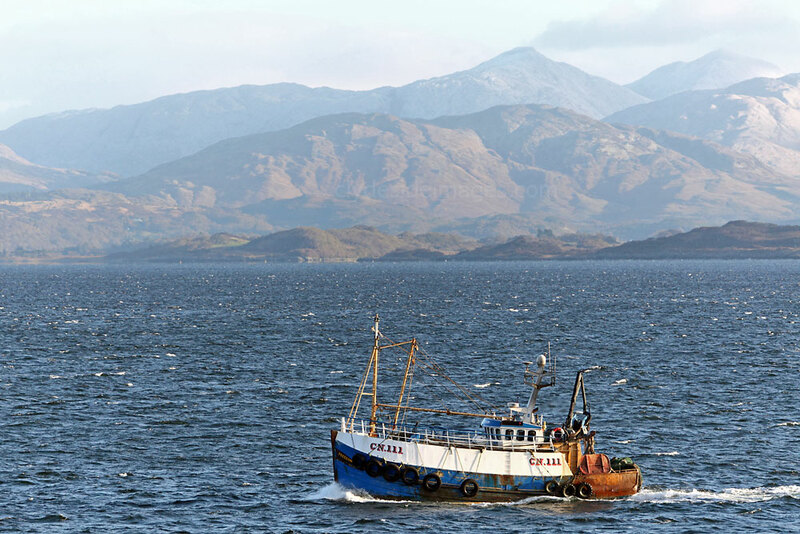 Around 20,000 Atlantic Salmon escaped through gaps in the cages at the farm which is run by Scottish Sea Farms at Bloody Bay, two miles north of the island’s capital, Tobermory. 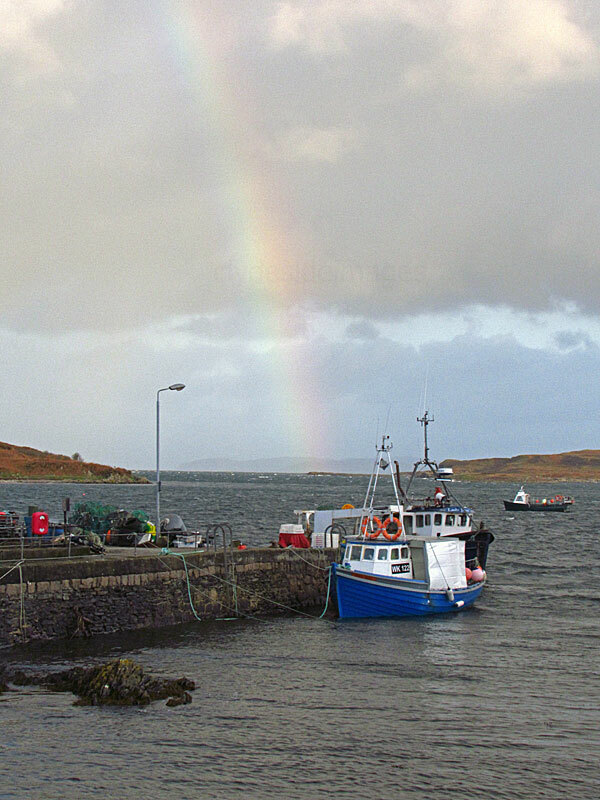 The location is so dramatically named due to a naval battle fought in the 1480s between John MacDonald of Islay, the Lord of the Isles and the Chief of Clan Donald and his son, Angus Og Macdonald. Angus Og won but it was a Pyrrhic victory - many of his clansmen had died in the battle and nearly half of the clan's galleys had been sunk. As a result, the power of the Lords of the Isles was greatly diminished. Live Fish Carrier Ronja Supporter at a Fish Farm in Loch na Keal, off the south end of Ulva. November 2017. The salmon released into Bloody Bay averaged almost 3lb each and would have been scheduled for harvest the following year. Around 1,300 wrasse, used as “cleaner fish” to keep their larger neighbours free of sea lice, also swam free. 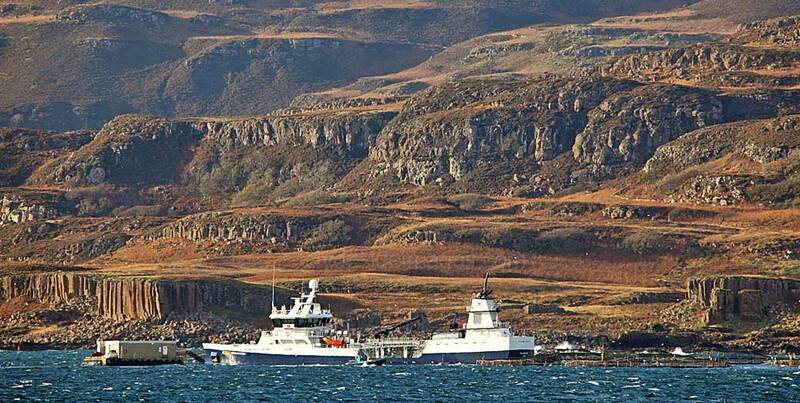 This loss is the biggest in Scotland since 30,000 fish escaped a site in the Outer Hebrides in May 2016 and could have environmental consequences for the Sound of Mull. A recent Norwegian study suggests that domesticated escapees mating with wild fish could weaken the wild population. 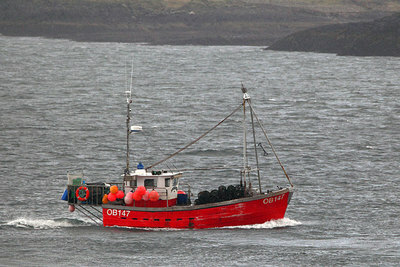 Although registered in Wick, Maple Leaf (WK-122) lists her home port as Oban. 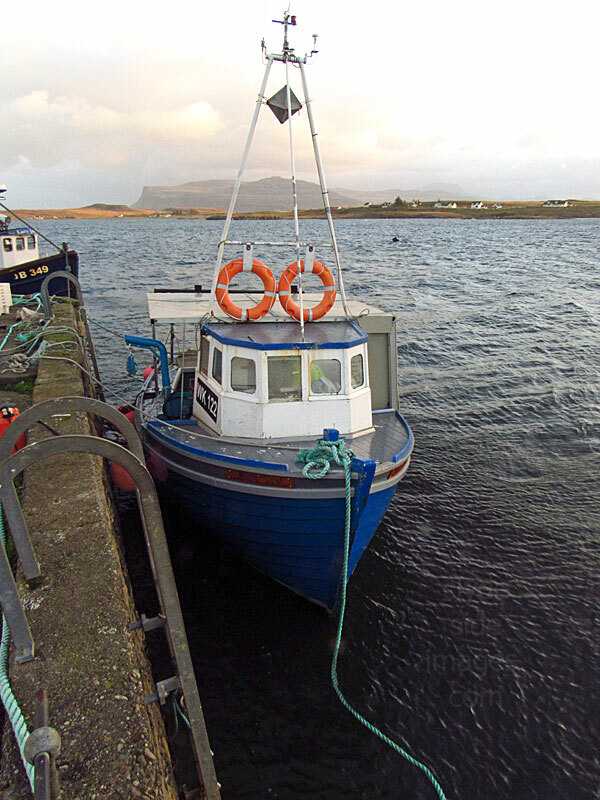 She is seen here tied alongside the pier at Bunessan on a blustery morning in November 2017. Of all wood construction, the 8 metre-long shellfish boat dates from 1973. ​Another one of the Turus Mara fleet, Island Lass was built by Crinan Boats Argyll in 1967. She has plied the West Coast of Scotland with the Mull-based cruise outfit ever since. 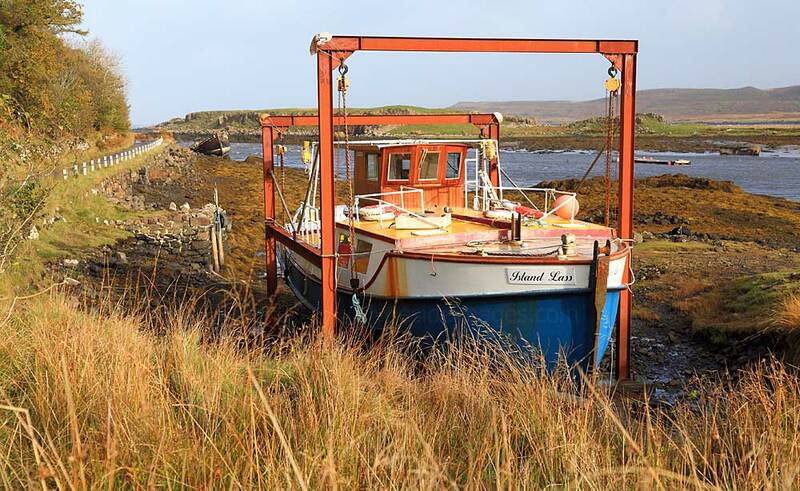 ​She is pictured here out of the water at Croig in October 2014. The vessel`s design is similar to that of a wooden fishing boat and her construction incorporates substantial quantities of mahogany and oak. Twin 110 HP diesel engines enable a cruising speed of 9 knots. Licensed by the Marine Coastguard Agency as a Class VI passenger vessel for 63 passengers, she has covered space for approximately 30. 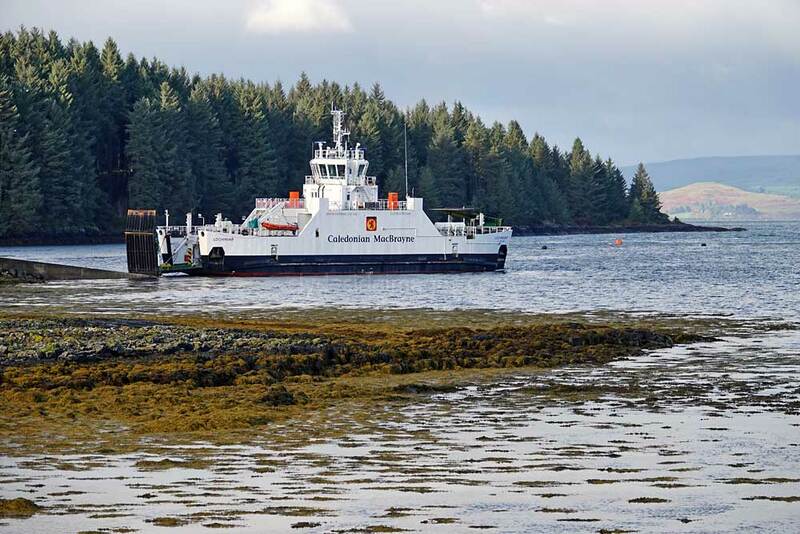 ​The only interesting vessel at Mull`s capital Tobermory when I visited the island in May 2014 was Cordelia II. 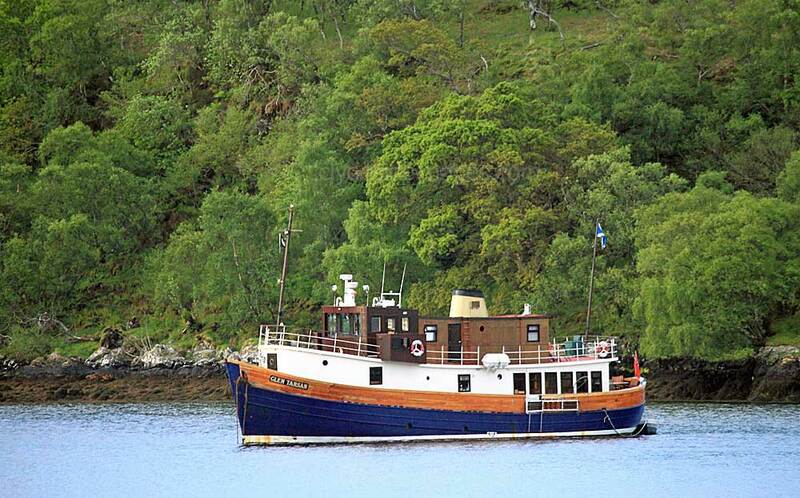 She was built in 1929 as a Gentleman's Yacht by the famous yacht builders Dickies of Tarbert, Argyll, for Mr John Anderson, a wealthy vegetable merchant from Cumberland. Designed for a crew of four, she was built utilising the very best materials such as Burmese teak planking on grown oak frames and bronze fastenings and fittings throughout. Both her original Gardner 3J5 three cylinder engines are now in preservation, one currently on display at the Liverpool Maritime Museum. In 1939 Cordelia II was requisitioned by the Ministry of War for harbour protection duties and operated primarily in the Clyde estuary on anti-submarine patrol duties. By 1946 she was back with Mr Anderson and remained in his ownership until the early 1950s. Thereafter she changed hands several times and was re-engined but her overall condition gradually deteriorated. In 2005, however, Cordelia II was able to take part in the Royal Spithead Revue before the Queen to celebrate 200 years since the Battle of Trafalgar. After the event the vessel remained for some years in the Thames estuary alongside the Chatham Maritime Museum. Her current owners found her there in 2011 and quickly realised that, while she was cosmetically in a very poor state she was fundamentally sound. 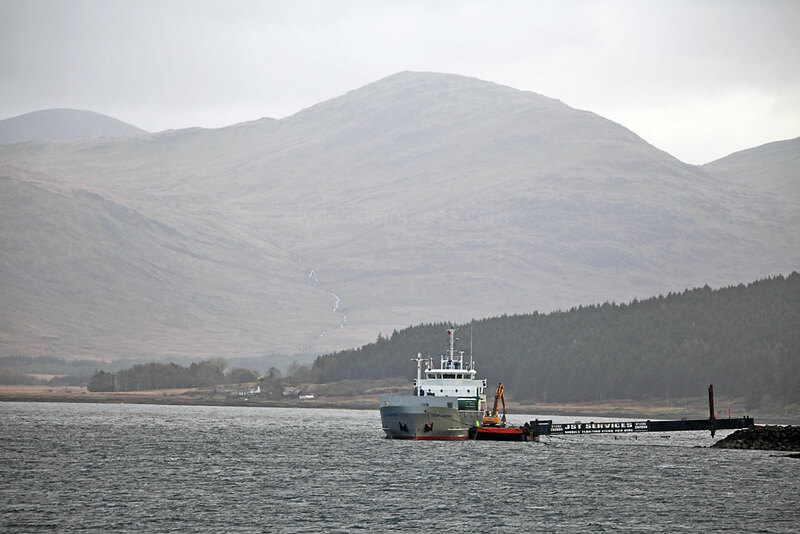 They sailed her up the east coast and through the Caledonian Canal to her new base at Tobermory. 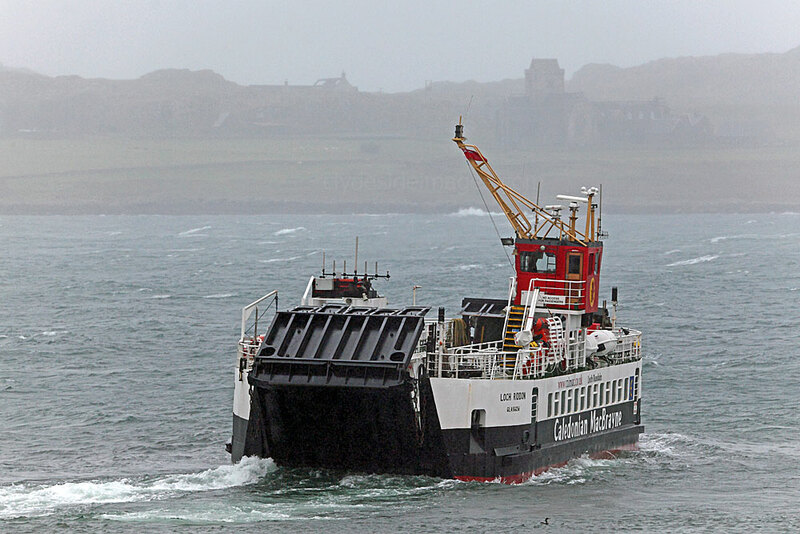 Renovation work required to qualify for a commercial certificate to enable her to carry passengers has since been carried out. 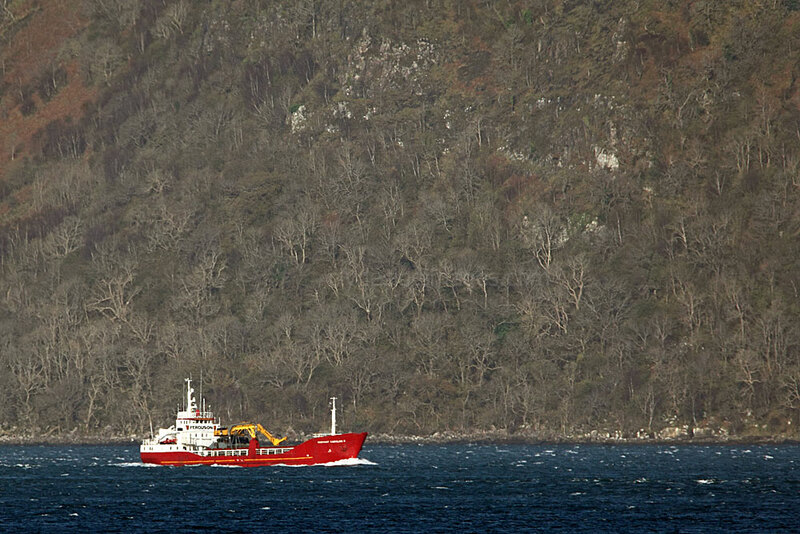 ​I took these shots of the Dunoon-based Majestic Line's Glen Tarsan and Glen Massan in May 2014. 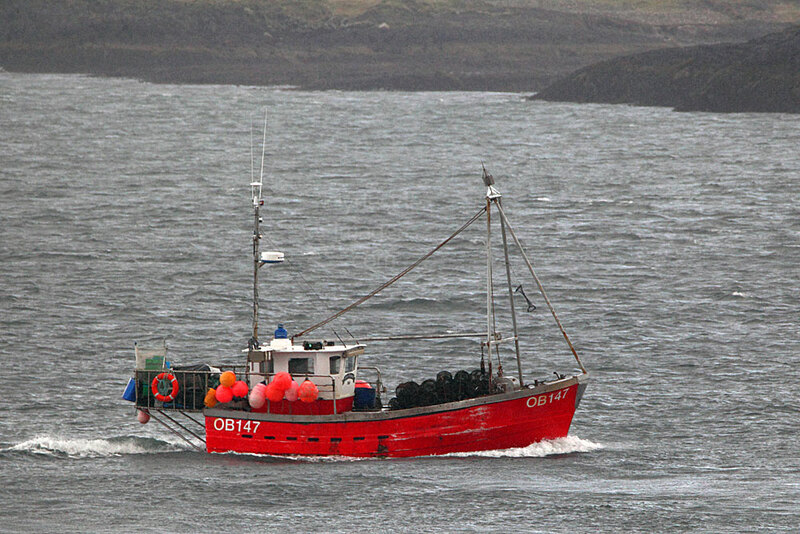 These classic 85ft long wooden-hulled trawlers were originally built by the Irish Government to assist their fishing industry. 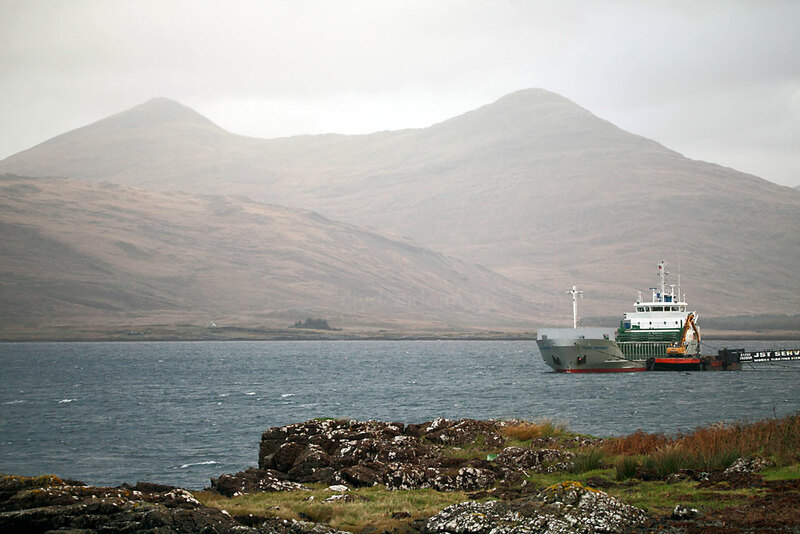 ​The first one I came across was Glen Tarsan which had dropped anchor in Loch Beg, a small sea loch which is actually an extension of Loch Scridain on Mull`s west coast. 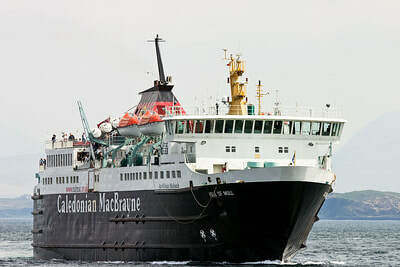 ​Bought by friends Andy Thoms and Ken Grant in 2004, Glen Massan was the first trawler that they converted to operate as a mini-cruise liner. 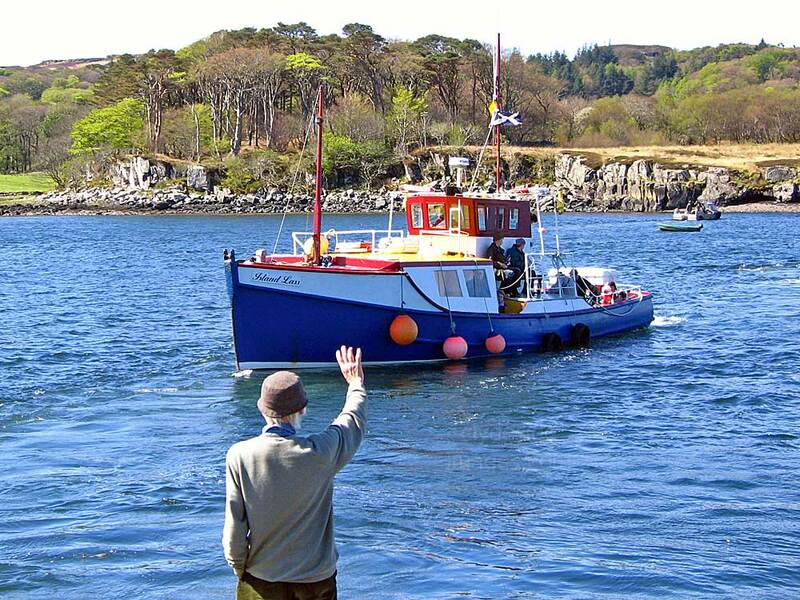 In May 2007 her sister vessel was launched and now both 'Glens' cruise the sheltered sea lochs and islands of Argyll and the Hebrides, visiting many locations not on the traditional 'tourist trail' and often exploring waters and inlets inaccessible to larger ships. The inspiration for the company name came from an episode of the classic BBC comedy series Vital Spark which ran from 1959 until 1974. Following a heated argument with the iconic Clyde Puffer`s skipper Para Handy, MacPhail, the engineer, walked out of his job having claimed to have signed on with a fictitious company 'The Majestic Line', adding that he was about to sail to Rome on their ship which oozed so much class that it even had a gold funnel! (In homage, both the Glens sport gold-painted funnels). 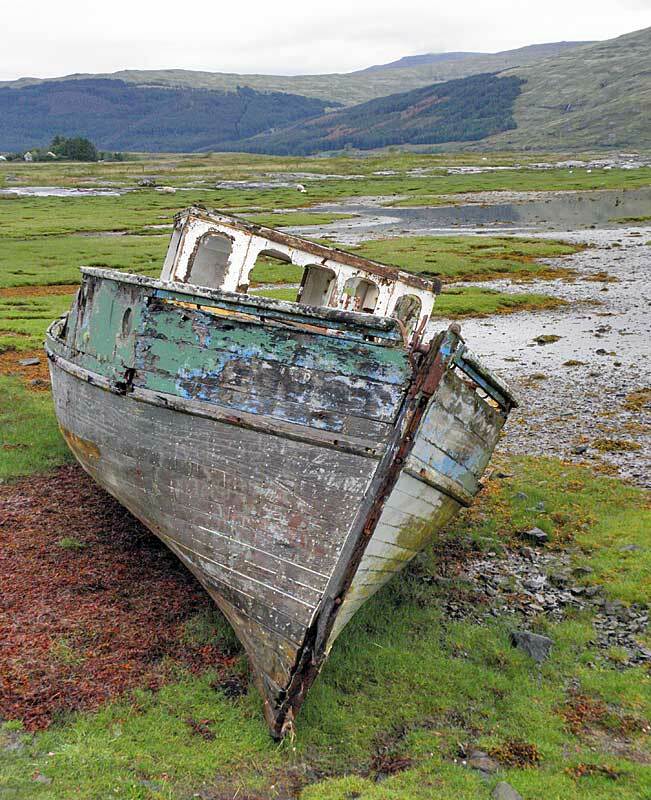 ​On driving to Loch Buie for a walk the following day, I discovered that both Glen Tarsan and Glen Massan had moved round to the south side of the island. They had dropped anchor to overnight in Loch Spelve, a large sea loch which is connected to the Firth of Lorne by a narrow neck of water. 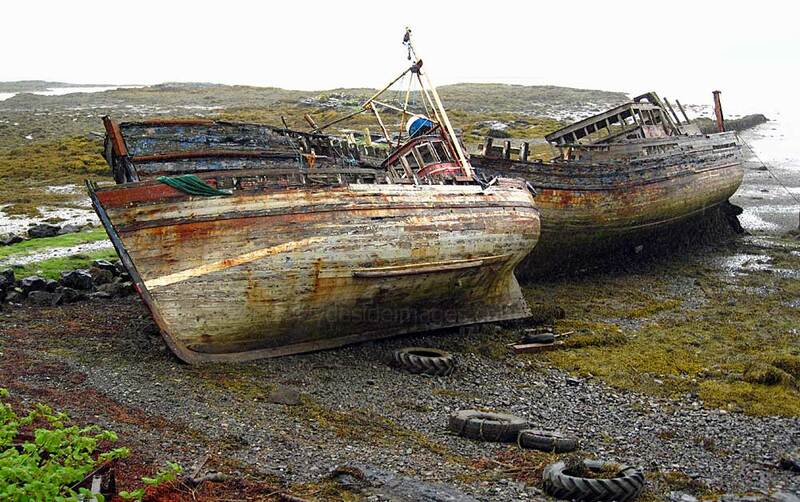 ​These wrecked trawlers on the Isle of Mull's east coast just north of Salen must be the most-photographed fishing boats in Scotland! It's not difficult to see why they make such a popular subject and there was usually someone snapping away when I passed by. By 2017, however, both wheelhouses had gone and only the decaying hulls remained, taking away much of the appeal.